I am happy to learn that when we turn west on I-80 headed out of Salt Lake City we will pass the southern tip of the Great Salt Lake. We wanted but did not get to visit Antelope Island on the lake during our short stay here. 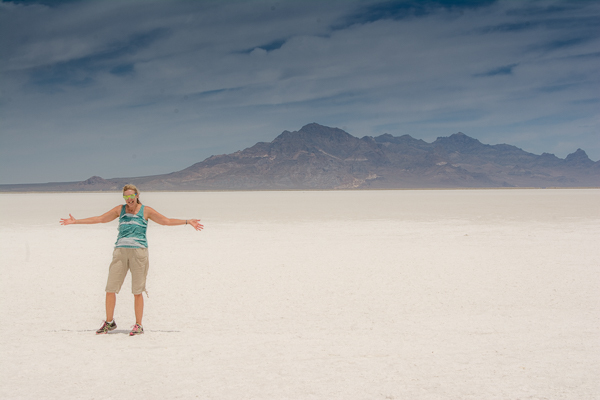 The scenery along I-80 from the lake to the Nevada state line is an incredible expanse of salt from horizon to horizon. We even pass a Morton Salt plant sitting beside a giant salt mountain. 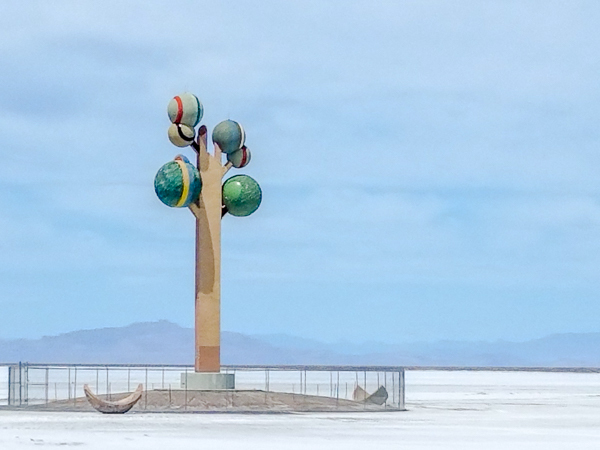 Just east of Wendover we pass a structure on the Salt Flats that I mistake for an ornamental cell phone tower. It is the Tree of Utah. This inspired work of a Dutch Sculptor is displayed right out here in the midst of all this salt! As we near Wendover, Utah we stop at a rest area located about 7 miles south of the Bonneville Salt Flats. A shoe washing station here makes it easy to traipse out into the salt for a picture and return to our vehicle with clean feet. We do not tarry here. Storm tolerates my dash into the salt for a quick picture then herds me into the rig. He does not want salt clinging to the layer of dust already coating our rig. We awaken the next mid-June morning in Elko, Nevada to discover a snowy picture framed by our RV windows. Life as an RVer sure can be a gamble. In fact*, Nevada’s gambling industry was born in this town and there are still plenty of old and newer casinos lining the streets. Our RV park even has a “slot lounge.” Each grocery store that we visit here houses one arm bandits which compete for our grocery money. As we select fresh produce, silent flashing sirens beckon us to risk it all from dimly lit alcoves overlooking the perishables. We avoid those temptations and spend the lovely few days before snow hits exploring the widespread scenic roads in the area. We complete stunning drives through Lamoille Canyon and up to Angle Lake before the weather drives us back to the RV. Nestled beside the Ruby Mountains, Elko is a tidy but not glitzy little town with expansive views, a feel of the old west and plenty of nearby snow to keep you cool! [ngg_images source=”galleries” container_ids=”54″ exclusions=”928″ display_type=”photocrati-nextgen_basic_imagebrowser” ajax_pagination=”1″ template=”default” order_by=”sortorder” order_direction=”ASC” returns=”included” maximum_entity_count=”500″]*Note: these so-called facts are just snippets of what I think I remember from our visit to the Northeastern Nevada Museum. A large and relic packed (even when Storm and I are not inside) building, that like so many museums nowadays has such low lighting and minuscule print on the signs that I may have totally misinterpreted their history. If that is the case, sorry Elko but us youthful retirees need more wattage and a larger font on our historical footnotes! You and me too! Not a place where anything appears to be living very long.